TEXAS BUDDIES (1932 World Wide) Bob Steele, Nancy Drexel, Francis MacDonald, Gabby Hayes. A couple of crooks force a mail plane carrying a large payroll to make a forced landing in a desert wasteland. However, their efforts to steal the payroll are thwarted by Bob and Gabby. With the pilot having been shot, Bob becomes pilot in hopes of catching the bandits. From 16mm. GALLOPING ROMEO (1933, Monogram) Bob Steele, Doris Hill, Gabby Hayes. Bob’s always getting mixed up with women that seem to be no good. In this enjoyable, sometimes humorous romp, he and Gabby stumble onto a father-daughter team partly responsible for a number of stage holdups. 16mm. 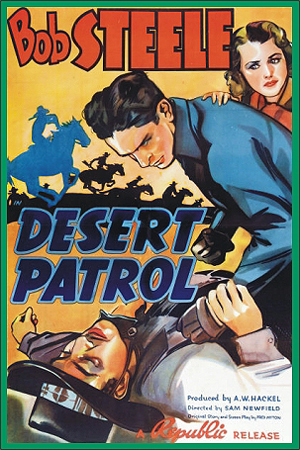 DESERT PATROL (1938, Republic) Bob Steele, Marion Weldon, Rex Lease, Ted Adams. A ranger is seized by bandits and tied to a wall by the sadistic Apache Joe (played to the hilt by Adams) who raises a knife and sadistically carves him up while his gang looks on in horror. Soon Bob comes looking for his dead pal. When he finds out what’s happened, he gets very, very ticked. Very engaging. 16mm. THE FEUD MAKER (1938, Republic) Bob Steele, Marion Weldon, Karl Hackett, Frank Ball, Roger Williams. Bob is a wild, young cowboy who is asked by his uncle to help intervene in a range war between cattlemen and nesters. Bob discovers that an outlaw gang--which he used to belong to in his wilder days--is actually fueling the hostilities and is responsible for the death of his uncle, found shot in the back.